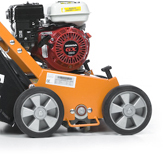 Its working width makes the ELIET E401 ideal for small and medium-sized gardens. Its robust design prevents any wear. As is the case with all other dethatching machines, this one is also armed with a set of ELIET Permanently Sharp Blades™. Thanks to the infinitely variable height adjusters you can select height adjustment with great precision. Even though this E401 is the smallest dethatching machine in the ELIET range, it is capable of providing outstanding performance. The performance of this dethatching machine is often tested in many common applications, for example, when it is rented. Its robust construction is then also a guarantee for its durability. The blade shaft is located within a thick steel housing in order to protect bystanders from any flying chippings. 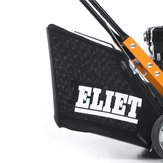 An ELIET dethatching machine with a dethatching width of 40 cm has a rotor that has 14 blades securely fitted. Each blade has two cutting edges so that the blade makes two raking motions for each revolution of the blade shaft. The blades are also mounted in a spiral pattern so that they do not all touch the ground at the same time in order to prevent grass sods from being torn loose. 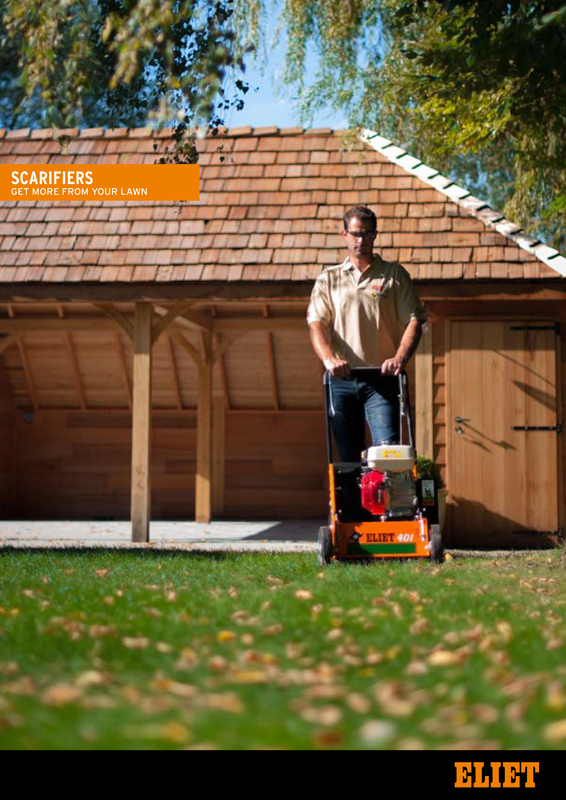 The ELIET E401 thus provides maximum efficiency with minimal damage to the lawn. The E401 comes fitted with 20 cm diameter wheels. Large wheels run more smoothly and are less affected by any unevenness in the terrain. The nylon rims are shock-resistant. Moreover, the roller bearings are able to withstand the sandy and dusty conditions that are encountered during dethatching. The rear wheels can be set to a number of different fixed positions. As a result of the dual adjustment capabilities, you can use the blades until they are completely worn. When you perform dethatching efficiently, you are also faced with a lot of cleaning up to do. ELIET help you in this respect by equipping the E401 with a collection bag. The wide opening ensures that the bag is optimally filled. The large 60 litre capacity of this collection bag is ample for the moss from several tens of metres. You are therefore spared from the burden of having to clear up the moss yourself.